IRC div 1 winner Hooligan - Marcus Blackmore. Photo by Salty Dingo, 2018. Fifteen divisions, 233 boats and close to 2,000 sailors from Australia, New Zealand and around the world spent Hamilton Island Race Week in the Whitsundays dashing around tropical islands with only saltwater hitting the decks, until the final afternoon rainstorm offshore broke the sunny and dry winter spell. Sou’east tradewinds built to their peak of 25 knots on Monday August 20 and close to that number the following day. Layday on Wednesday was ideal pool and Whitehaven Beach weather with little breeze and cloudless skies, and the second half of the week brought lighter ESE winds between 6-12 knots on average, and just the one shower in the closing hours of Saturday August 25, 2018. The supermaxi battle required an on-water umpire to be brought in on day four of racing, to monitor the pair. The Oatley family’s Wild Oats XI (HIYC) convincingly beat Peter Harburg’s same-length Black Jack (RQYS) in terms of first over the line results; now both crews return home to mull over where a few more seconds-per-mile can be teased out before the December ocean classic, the Rolex Sydney Hobart Yacht Race. A six-day arm-wrestle between the TP52s resulted in Marcus Blackmore’s Hooligan (RPAYC) scooping the IRC Division 1 prize from Matt Allen’s Ichi Ban (CYCA), with a day to spare. “We set a plan last year to win Hamilton Island Race Week,” Blackmore said prior to the final islands race, a new course out around Baynham Island to the south-east of Hamilton Island. Video of Blackmore and tactician Tom Slingsby. Team Hooligan added yet another victory to the owner/skipper’s tally, which includes the arbitrary division win at the first Hamilton Island Race Week way back in 1984. In between the 100-footers and TP52s, Phil Turner’s RP66 Alive (DSS) finished third overall and banked some crucial time on the water as part of their Sydney Hobart warm-up. Like Ray Roberts’ Team Hollywood (IRC Div 2 winner, CYCA) and Gerry Hatton’s Bushranger (IRC Div 3 winner, RPAYC), Hooligan elected to sail out the regatta they’d wrapped up on the penultimate day. IRC Division 4 top place went to Graham Furtado’s X41 Matrix from Queensland and he and all the division winners will gather at Hamilton Island’s Convention Centre this evening for the gala awards ceremony. “We were able to race every day in a combination of light to medium to heavy winds. It’s always tricky because of the wind and tide. The team worked hard to come up with courses and shorten when we needed to. “I think there’s good camaraderie around the fleet. Hamilton Island divisions has worked, maybe we’ll look at splitting into another division as some divisions were quite big, and to separate the racier boats,” Thompson added. 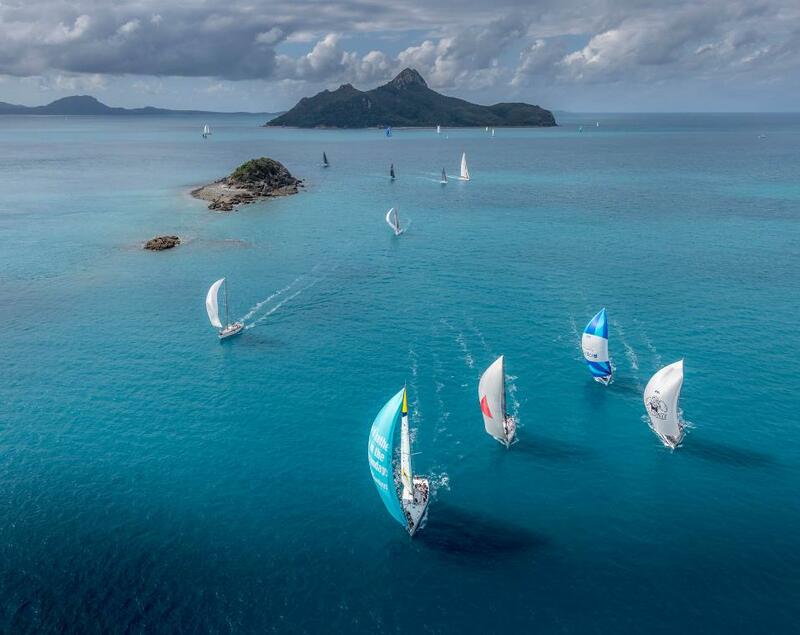 The dates for Hamilton Island Race Week 2019 are confirmed for August 17-24. Crews will have the option to continue on from the annual Sydney Gold Coast Race in July to the Brisbane to Keppel race and straight on to Hamilton Island in the one leg. The Royal Queensland Yacht Squadron initiative, called the Brisbane to Hamilton Island Race and announced at the Race Week opening function, will give the larger boats in particular the option to finish at Keppel and then cruise north or race straight through. The business end of Hamilton Island Race Week sees multiple divisions going into the final race on Saturday August 25, 2018 needing those last points to cement victory while in a couple of divisions the winners are already quietly celebrating. Roberts believes this win is his sixth overall in division at Race Week with various Hollywoods. The crew of Gerry Hatton’s Mat 12.45 from Sydney, Bushranger, will rest easy tonight knowing they’ve done enough in IRC division 3 to secure victory. IRC division 1’s key trophy is still up for grabs between the two TP52s, just two points separating the duelling Ichi Ban and Marcus Blackmore’s Hooligan. The Oatley family’s Wild Oats XI added one more line honours win to its tally of five from six starts, Oats’ tactician Glenn Bourke describing today’s islands race as “tactically exhausting”. Multihull racing comes in all sizes and shapes at Race Week and remarkably the competition has been very close in 2018. In the Hamilton Island Multihull Racing division 1 Eric Cook’s imposing Tag 60 Stardust is showing that size counts, even in more benign conditions. “For a big boat that weighs 20 tonnes we do remarkably well in light airs with a very powerful rig and long waterline that allows us to sail deeper than our lighter rivals,” said navigator Ian ‘Condor’ Smith. Watching Stardust rounding the top mark in race two today gave the impression that setting a spinnaker was relatively effortless: “Yes, we just spend the whole day leaning on joysticks and I’ve now got a broken fingernail!” Smith joked. In Multihull Racing division second-placed Morticia is working hard to make a late bid for the top spot on the podium, lying only two points behind Stardust. Owner Dale Mitchell, who took the all-black Seacart 30 Morticia to the Caribbean 600 this year, would probably prefer more of the severe conditions they experienced in that race than the continued light airs forecast for Saturday. Morticia not only survived Hurricane Irma ensconced in her container on the island of St Maarten, but the crew managed to finish the race despite the consistent 30-40 knots of wind - one of only four of the 13 multihulls that finished the gruelling ocean crossing. “We’ve still got some unfinished business, so we’d like to go back again someday,” said Mitchell. 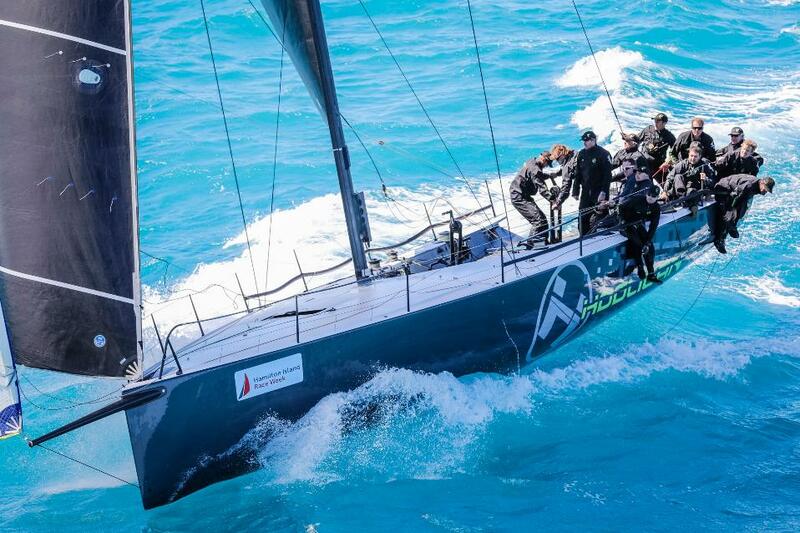 In Hamilton Island Multihull Division 1, the all-female Kiwi crew aboard the Crowther 40 are doing for sailing what the All Blacks are doing in the Bledisloe Cup – winning! Rod White, whose Farrier 8.2 trimaran Agape is in second position in Hamilton Island Multihull Division 1, is hoping that the Kiwis will get distracted by the beautiful island scenery, but is also enjoying the closeness of the racing: “The handicappers often get a bad rap, but it’s their job to keep it close across such different types and sizes of boats and I think they do a really good job at Race Week.”. In the Sailing Instructions there are 40 race courses to cover every combination of wind and tide, but each year PRO Denis Thompson finds that some permutation of conditions still requires a new course or two. And so it was today, with Courses 41 and 42 added to the list for the IRC, Multihull Racing and Hamilton Island Division 1 racing on the Eastern course to cater for an unusual easterly that was set to veer to the ESE. A Dent Passage start and finish had the remainder of the fleet on various courses that headed west and south using Pentecost, Cole and Pine islands as rounding marks. The forecast for the final day of racing on Saturday August 25 is the slight chance of a shower with winds E-NE at 8-14 knots. Traditionally the Lindeman Island race completes the on-water program before crews attend the awards ceremony at the Hamilton Island Convention Centre. Winds returned to light northerlies at Hamilton Island Race Week on day four of the six-day on-water program in the Whitsunday islands of North Queensland. A new windward/leeward course around Yandala and Edwards Islands to the north-east of Hamilton Island befitted Peter Harburg’s Queensland 100-footer Black Jack. They took a first line honours win off Wild Oats XI from four starts, despite potentially handicapping themselves out with an individual recall at the start. Black Jack’s stumble in Turtle Bay became their winning move when the credentialled crew of Tom Addis, Iain Percy (UK), Anthony Nossiter, Billy Merrington and skipper Mark Bradford, among others high-level sailors, opted for a different tack to the main bunch. Harburg’s supermaxi with the Formula 1 chequered flag livery headed offshore where the breeze incrementally built to a top-end 8 knots out of the north and they moved into first in the fleet, followed to the finish by Phil Turner’s RP66 Alive. In race two the Oatley family’s Wild Oats XI evened the day’s score. “We cleaned them up nicely at the start, they managed to swing and tack off on port and we ended up in battle with the 50-footers and had to duck Alive,” Bradford said. For the second island windward/leeward start the breeze marginally increased to 10 knots and combined with flatwater offshore conditions all IRC divisions completed their courses by late afternoon before the motor back to Hamilton Island harbour at dusk. Dutch navigator Wouter Verbraak and Will Tiller driving Alive picked up their best result in race four, beating Wild Oats XI over the line and placing second to Marcus Blackmore’s TP52 Hooligan on corrected time. Alive’s trim coach Mike Mottle said, “Alive’s day was fantastic – we had a great first race and found ourselves in between the two 100-footers at the top mark. The TP52s have still got the upper hand on us. How lucky am I to be here?” he added. Two handicap wins on Thursday August 23 has Marcus Blackmore’s TP52 Hooligan now in front of Matt Allen’s Ichi Ban by two points. Ray Roberts’ Fast 40 Team Hollywood is edging away from its key challengers, Darryl Hodgkinson’s Carkeek 40 Victoire and fellow Sydneysider About Time, Julian Farren-Price’s Cookson 50. Upwind and downwind in 10 knots of breeze is when Gerry Hatton’s Mat 12.45 Bushranger, with retired boat builder John McConaghy and owner Gerry Hatton sharing the driving, comes into its own. “Bushranger is set up for those conditions; it was just right for us,” said tactician Michael Fountain. “Everything came together just nicely for us with a couple of good starts and getting the shifts right. David Griffiths’ Yarrandi is second overall after five races. Graham Furtado’s Queensland X41 The Matrix is the IRC division 4 series leader. The forecast for the penultimate day of racing on Friday August 24 is partly cloudy and a repeat of light winds at first, tending E-NE at 6-12knots during the afternoon. Another winter dazzler blessed the Hamilton Island Race Week fleet; sun, wind and whales to see out the first half of the annual Whitsunday series, August 18-25. The Club Marine classic long and medium race for IRC division 1 and 2 was a 50 nautical mile race Wild Oats XI tidied up in 3 hours 44 minutes, giving them an average speed of 13.3 knots over the course to the north-west of Hamilton Island. Cool winter SSE tradewinds of 23 knots at the start down to 12 knots by mid-afternoon were well-managed by the diverse fleet of supermaxis and other keelboats, multihulls and trailables from around Australia and overseas. All points of the compass were covered in today’s long and medium distance island courses, stretching as far north as Double Cone for IRC Division 1, Hamilton Island Division 1 and Multihull Racing. Marcus Blackmore’s TP52 Hooligan is now only one point off Matt Allen’s TP52 Ichi Ban thanks to a corrected time scoop in race three. The calibre of the two 52 crews and the hot competition between the like-boats has the sailing media covering Race Week suitably impressed. “It’s very close racing between us and Ichi Ban, it’s a case of who gets the start, who gets the first shift; in the light airs we have little bit of height on them, but as Mike Fletcher, our coach for some years said, ‘he who makes the least mistakes wins’,” Blackmore shared back at the dock as his team celebrated. Amongst Hooligan’s star-studded crew is Laser gold medallist Tom Slingsby calling tactics and Spanish helmsman Rafa Trujillo, a silver medallist in the Finn Class in the 2004 Athens Olympics and an America’s Cup and Volvo Ocean Race sailor. “He’d been living in New Zealand and the Australian Sailing Team, who we sponsor, managed to encourage him to come and live in Australia and coach the Finns for the next Olympic Games,” said Blackmore. IRC division 2 is proving tough for those trying to chase down Ray Roberts’ Botin 40 Team Hollywood, given their perfect scorecard of three corrected time wins. ““The boat’s probably one of the nicest boat’s I’ve ever sailed. Marcelino Botin has designed a beautiful boat and we now just have to sail her well,” Roberts said post-race on Tuesday August 22, 2018. A broken rudder pulled up the New Zealand Rapido 60 Romanza and they weren’t able to finish their long race. Dale Mitchell’s Lombard tri Morticia leads the Multihull Racing division from Stardust. Hamilton Island division 1 leader Drumfire, Phillip Neil’s superb Hoek TC78 design, is ahead of Robert Vaughan’s Muir 64 Van Diemen III on a countback in the pointscore for what should be renamed ‘the grand division’ with the beautiful hull shapes of the classic designs among the vintage maxis such as Condor. The Hamilton Island cruiser racer and Multihull divisions, Non-spinnaker and Trailables started from the Eastern Course and enjoyed variations on a theme that included a downwind run in flat water through the scenic Long Island Sound. The Trailables were the first home, rewarded for their long haul to the Eastern start line with a straight run west to Pine Island and home. First home was BSC Sailing School and overall the local Rhumbmaid with the crew name ‘Team Effort’ leads the series by two points. Three days of racing for 233 yachts marks the midway point of the 35th edition of Race Week and now there will be a break in the on-water schedule, on Wednesday August 22, with racing set to resume on Thursday. Morning breeze on at Hamilton Island left some opting for an extra layday while those who did venture out in the sou’easterlies were paid handsomely with moderating conditions and another perfect pour of winter sunshine at Hamilton Island Race Week 2018. Hamilton Island airport’s 36-knot gusts at 9am and whitecaps in Dent Passage were the reasons for regatta director Denis Thompson’s calling for an hour’s postponement to all racing, and why a quarter of the 233-boat fleet opted to remain ashore on Monday August 20. Day 2 sailing video highlights thanks to Broadkast. Competition got underway soon after 11.30am, both in Dent Passage and out at the Eastern course area where the sea-state was confused by 20 plus knot sou’easters from 1.00am this morning. By 1400hrs the wind was back to 12-15 knots on a sparkling day two of the six-day pointscore series that will be decided on Saturday August 25. That’s two line honours wins from two starts for the Oatley’s supermaxi. Peter Harburg’s skipper Mark Bradford said Olympic and America’s Cup yachtsman Iain Percy’s solid tactics helped get the same length Black Jack just in front by Isolated Rock, the second mark of the course, but they weren’t able to hang on to the silver bullet. “We hit our top speed of 20 knots and had a good run back from the island,” Black Jack’s skipper said. Matt Allen’s TP52 Ichi Ban crew made it two from two on corrected time in IRC division 1 and Hooligan had to again be satisfied with second to be second overall. Ray Roberts’ Fast 40 Team Hollywood leads IRC division 2, also scoring two corrected time wins, from Julian Farren-Price’s Cookson 50 About Time. Eric Cook’s Tag 60 multihull Stardust was, like many, caught out by how quickly the morning’s heavy airs moderated. “It was still blowing 28-30 knots less than 15 minutes before the start so we didn’t bother rigging up our spinnaker halyard” said Stardust’s skipper Ian ‘Condor’ Smith. “Then it dropped out big time five minutes before the start. Luckily we had a rigger on board because the holding pin on the halyard lock has to be sewn in place. The Stardust team’s boy-scout-readiness also gave them the edge over their closest rivals, Dale Mitchell’s well-travelled Lombard trimaran Morticia. Stardust and Morticia share top spot in Multihull Racing. John Williams’ Tyee III from Sandringham Yacht Club in Victoria leads Hamilton Island Multihull Division 1 from the Sharon Ferris-Choat skippered Ave Gitana with a mixed Aussie and Kiwi crew. Meet the crew and take a tour of the Crowther 40. The forecast for Tuesday August 21 is sunny with S-SE winds averaging 12-16 knots, easing to 8-12knots and tending SE-NE during the afternoon. Wednesday is the layday and mid-series break. An unhurried start gave way to a magic opening race around the Molle Islands group for most of the 233 yacht crews contesting Hamilton Island Race Week 2018. On the water, day one began quietly with all but IRC, Hamilton Island Division 1 and Multihull Racing divisions starting from Dent Passage. The first divisions beat painfully north from the start line in the fading remnants of an early morning nor’wester until early signs of the promised tradewind sailing arrived from the south. In no time kites were popped and the classic Dent Passage conveyor was carrying the fleet past Titan Island, out into the Whitsunday Passage and across to the Molle Islands. The remaining divisions set off from the Eastern Course off Catseye Bay and the IRC fleet was soon converging with the cruising divisions and engaging in a series of gybing contests down Whitsunday Passage in 12 knots of south-easterly breeze. The Oatley family’s 100ft Wild Oats XI got the better of Peter Harburg’s Black Jack by seven minutes over the line and first strike on corrected time between the warring TP52s from Sydney went to Matt Allen’s Ichi Ban from Marcus Blackmore’s Hooligan. Robert Vaughan’s eye-catching Muir 64 Van Diemen III was the division 1 winner of the inaugural Hamilton Island Class, an initiative of five new divisions at Race Week that seeks to level the field further for the highly diverse cruiser/racer fleet. The race committee’s choice of a short islands race to the Molles to ease the fleet into Race Week was vindicated with all divisions enjoying an early afternoon finish, concluding with the hallmark cross-tacking silhouette for the final beat into Dent Passage. Crews will switch modes on day two with strong southerlies predicted to reach 30 knots tomorrow, Monday August 30 - likely to test soft winter hands and rusty technique. The customary Club Marine Skippers Welcome Party on Saturday evening at Hamilton Island Yacht Club attended by Queensland Premier Hon Annastacia Palaszczuk was an opportunity to recognise the many sailors who have travelled from every Australian state plus the ACT, and from overseas, for the 35th edition of Race Week in the Whitsunday wonderland. At the function Hamilton Island CEO Glenn Bourke announced the island had partnered with the Royal Queensland Yacht Squadron to host a new race in 2019 from Brisbane to Hamilton Island in early August, immediately following the annual Sydney Gold Coast Yacht Race.